The Touch of the Horse! Equine Assisted Psychotherapy provides a hands-on approach that challenges individuals to look at themselves and the world around them in a new way. Individuals who have struggled to make progress or achieve treatment goals have made significant breakthroughs with the aid of equine therapy. 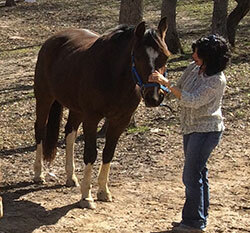 Equine therapy is an alternative to traditional counseling that involves using horses as part of the therapy process. Horses add an incredible element because they’re truth tellers. They’re mighty and huge but their spirits are genuine. 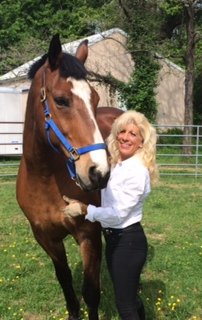 Equine therapy provides immediate feedback based on the horse’s response to an individual. What can a client expect from Equine Assisted Psychotherapy? Research has shown that equine therapy lowers blood pressure and heart rate, alleviates stress, and reduces symptoms of anxiety and depression. It also helps those struggling with addictions and mental health disorders to develop necessary skills for healthy living. This type of experiential therapy works with emotions at a deeper level and supports the process of self-discovery; the raw and unstructured product is a part of the therapeutic process. The use of horses gives self-awareness, insight, and understanding, which can be achieved by delving into the emotions. Feelings of anger, grief, fear, joy, and happiness are the tunnel through which we must pass to attain self-awareness, understanding, and wholeness. What does an equine therapy session look like? When clients are beginning a horse therapy program, the instructor will have the horse stand in the middle of the arena. The client is supposed to get the horse to move outside of a large circle without touching the horse. Many clients clap, whistle, or yell to no avail. The lessons taught are when others, be it parents, friends, counselors, or associates, try to get us to do something, the best way is not by yelling, clapping, or forcing, and clients learn the best way to lead a horse is not in front or behind the animal, but by its side as an equal. 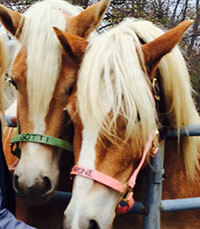 Equine Assisted Psychotherapy and Trouble Teens Team Up. The horses also provide an excellent way for troubled youth to react when they are otherwise therapy-resistant. The horses provide honest and immediate feedback that can be used as a tool for our teens to learn how to deal with strong and highly charged emotions. Many boarding schools offer residential treatment for troubled teens, but few offer equine therapy as a means to healing many of the common social, and behavioral disorders that exist in many teens today. Psychologists and counselors have discovered many effective treatment programs for troubled teens. The leading new treatment involves Equine Assisted Therapy – or the use of professionally trained horses as part of the counseling process. Many studies have been done to show the effects of building relationships with animals and horses. Endorphins are released into the body and decrease chemicals, which cause stress and arousal when sessions with horses are experienced by troubled youth. Troubled teens are typically in a state of aggression, defiance, or anger. 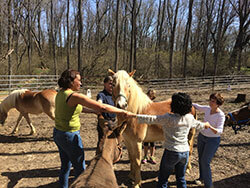 Using horse therapy with these teens helps maintain a constant and healthy chemical balance. 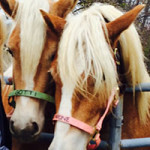 Not only do horses provide therapy as a result of chemical connection between the human and horse, they also provide troubled youth with an opportunity to learn how to control and work with animals. Horses can often times be stubborn, reluctant to follow orders, and have to learn how to get along with a team. Learning how to work with horses will help them in their day-to-day lives as they deal and work with humans. Teens will learn how to properly lead, groom, and take care of the animals. These teens may realize that they exhibit some of the exact same behaviors as the horse. By learning how to get along and work with the horse they will better understand their own emotions and body language. Horses cannot speak like humans, and careful attention must be placed on their body language. They will let you know if they are nervous, relaxed, frustrated, exited, or dangerous by their body language. Learning how to recognize this language is key in learning how to train and become one with a horse. adjustment disorder, bipolar disorder, dissociative disorders, grief/loss, personal growth, PTSD, self-esteem, sexual abuse, stress management, life transitions, and spirituality.